Harry Bertoia made a foray into furniture design in the 1950s with Knoll Associates that was brief, but so powerful and enduring that the royalties from his series helped enable him to turn his attention to sculpture for the rest of his life. Born in Italy, Bertoia moved with his parents to America in 1930 and he attended Cass Technical High School in Detroit. On a scholarship, he went to the Cranbrook Academy of Art in 1937. When he started, he concentrated on printmaking and drawing, selling his work through a gallery in New York. In 1939 he established a metalworking and jewellery studio at Cranbrook and became head of the department, remaining in the position until 1943. While at Cranbrook, Bertoia began a relationship with his colleagues, Charles and Ray Eames, which would extend into a complex working relationship. Bertoia joined the Eames in their California studio in 1943. They were involved in a wartime project for the Evans Product Company, providing technical work for airplane and medical equipment. Bertoia was also drawing training manuals. At this point they began to experiment with molded plywood under the auspices of their Plyformed Products Company, which was later bought out by Evans. With Eero Saarinen they developed a method for making molded plywood splints that would later evolve into processes for designing furniture. Bertoia remained as part of their staff, working on a variety of projects, until 1946 when he left, citing creative and professional differences. In the 1950s he began a working relationship with another Cranbrook classmate, Florence Knoll, who had a studio in Pennsylvania and offered Bertoia a flexible and supportive environment in which to design. 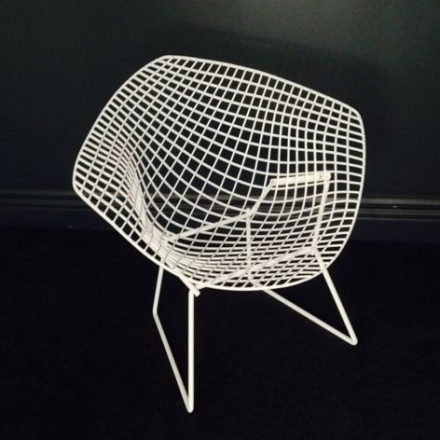 He produced his immensely popular steel mesh series of furniture for them, which included the “Diamond” chair, one of the most iconic images of American modern furniture design. The pieces grew out of a sculptural aesthetic, and Bertoia wrote that when looking at the chairs you could see that “space passes through them.” Indeed, their frames are so delicate and skeletal that in the Knoll print advertisements it is sometimes difficult to see the chair at all. They were produced with varying degrees of upholstery over their light gridwork, and they were handmade because a suitable mass production process could not be found. Unfortunately, the chair resembled an Eames chair so closely that Herman Miller, Eames’ distributor, took Knoll to court on the grounds that they were taking wrongful credit for a bent-wire technique owned by the Eames. Herman Miller eventually won and gave Knoll a license to produce the chairs. After the 1950s Bertoia retired from furniture design to focus on his sculptural work and jewellery, although he was retained as a consultant to Knoll until the 1970s. The sculptures he produced explored the ways in which metal could be manipulated to produce sound. By stretching and bending the metal, he made it respond to wind or to touch, creating different tones. He performed with the pieces in a number of concerts and even produced an album, “Sonambient,” of the music made by his art.